Many of us homeschoolers are automobile-dependent. Living in rural or suburban areas and in some small and medium size towns and cities, we find that our communities aren’t “walkable,” and there is no public transportation to speak of. There is certainly no school bus serving our family. Since our kids aren’t in the “big box of school” we have to drive to many of the activities and classes our kids participate in. With three kids in a wide age range and with a diversity of interests, over the years I have found myself constantly traveling from one “homeschool thing” to another, also mixing in our regular errands. I found that keeping “extras” in the car is a big help, so we didn’t have to turn around for forgotten items, and we were a little more ready for the minor crises of life. Diapers and extra clothing for Baby. Yes, this means in addition to what was in the diaper bag. Sometimes I needed to call on these supplies, either because I’d left behind my diaper bag or forgotten to restock it. Dry clothes and old shoes for the toddler and preschooler. Not just because of typical “accidents,” but because of all the times we went to park days and found puddles at the end of the sliding board or other splashy episodes. Trash bags and a towel. See wet toddler above. The trash bags provided a way to get the sopping clothes and shoes home. First aid kit. We definitely used our share of bandaids, antibiotic ointment, antiseptic, and acetaminophen. I always kept some “skin-your-knee” size bandages in the first aid kit as well. Roll of paper towels. Because kids. Sports stuff. During our soccer years, there were extra shin guards; during our skating years, there were extra skate socks. I also still keep a needle for inflating balls in my glove box. You can stop any place that has air for car tires and pump up a ball — if you just have a needle. And yes, there have been quite a few years when we never went anywhere without a couple soccer balls in the car. Art/activities tote bag for kids. Especially when my oldest kids were doing activities like music lessons, I carried a bag for my youngest with special art supplies, kids’ magazines, paper, scissors, tape, and glue. We were able to make the most of our waiting times by drawing, making, and reading together. Music supplies. Today, my car has a plastic bag with extra guitar strings, picks, and pegs. More than once we’ve dug into the stash to replace a broken string at a desperate time. Books. For many years, I kept several books in the car, often a few from each library visit. Again, during downtime while one brother was waiting for another brother, we found reading time. With the advent of smart phones and tablets in our household, I’ve found that the books-in-the-car-just-in-case habit has given way to reading on a device. Electronics. My husband is better at keeping this bag stocked than I, and when we’re traveling with him, we can count on him to have extra phone chargers, batteries for cameras and other gadgets, headphones, and splitters. Toll money. I have a small coin purse I keep in my console, and I keep it stocked with quarters for tolls. There were also the years that I kept a $20 bill in there and mostly managed to forget about it, so it would be there for an emergency. Bug spray and sun screen. This tells you all you need to know about summers in Virginia, and I try to be prepared. A spring park day can turn out to be much sunnier than expected — and cue the mosquitoes. Paper and pens — for grownups. As a writer, I try to keep the tools of the trade on hand. Tea bags. Yes, really. I love my tea, and I have found that many places have complimentary hot water, often with their coffee set-up. I have enjoyed many an afternoon pick-me-up because I had Earl Grey tea bags stashed in the car. Sometimes a small pleasure gets a harried homeschool mom through the day. Remembering to stock the car with what I am likely to forget or need unexpectedly has saved the day numerous times during my 17 years of homeschooling. 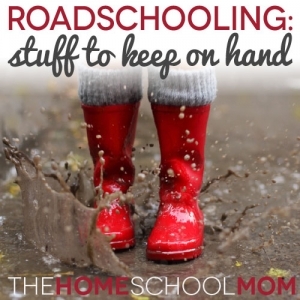 What do you keep on hand to ease your road schooling?